This deluxe pressure reducing wheelchair cushion is designed to assist in the prevention, treatment and management of pressure ulcers. Viscous Gel provides optimized pressure reduction, support and comfort. 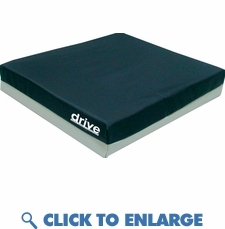 This wheelchair cushion has a Fire Retardant polyurethane foam shell. It has a convenient removable and replaceable cover that is water resistant "Top" and "Non-Slip" vinyl base. See specifications for appropriate cushion for weight capacity. 18 Month Limited Warranty on cover and cushion. Compare to Mason Gel-U-Seat, Blue Chip Gel Pro DLX, Invacare Comfortmate, Invacare - Infinity Lo Contour & FLA Postura Gelfoam.